In sauté pan heat canola oil over medium-high heat. Add half of garlic and sliced onion and sauté until browned. Add shredded chicken and pepper. Cook until heated through. In saucepan over medium heat, combine tomatoes, remaining garlic, jalapenos, water, oregano and chipotle chile to make the salsa. Bring to a boil. Remove from heat. 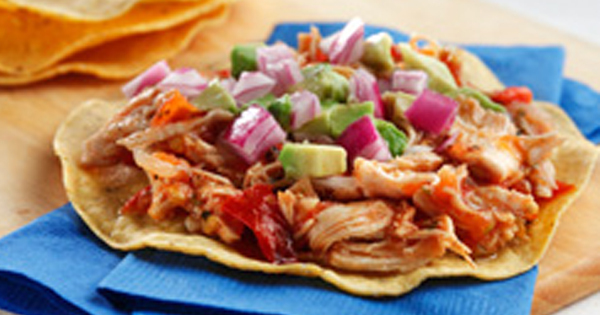 To serve, warm tostadas and divide chicken mixture equally on each tostada. Garnish with red onion and avocado. Serve with salsa. * to grill tomatoes, slice in half and remove pulp and seeds. Place face down on grill pan for 2-4 minutes. ** use fewer jalapenos if less spice is desired. Prep Time: 20 min. Cook Time: 20 min. Servings: 4 Source: www.heartandstroke.com (recipe and photo provided by CanolaInfo.org).